Using a tool called Star History, we can see that this measure in particular tells a story of React's historical dominance being overtaken by the skyrocketing Vue. As is often the case when the popularity of frameworks is raised, this sparked a huge amount of debate about which framework is "really" more popular, which framework is more powerful, and more. 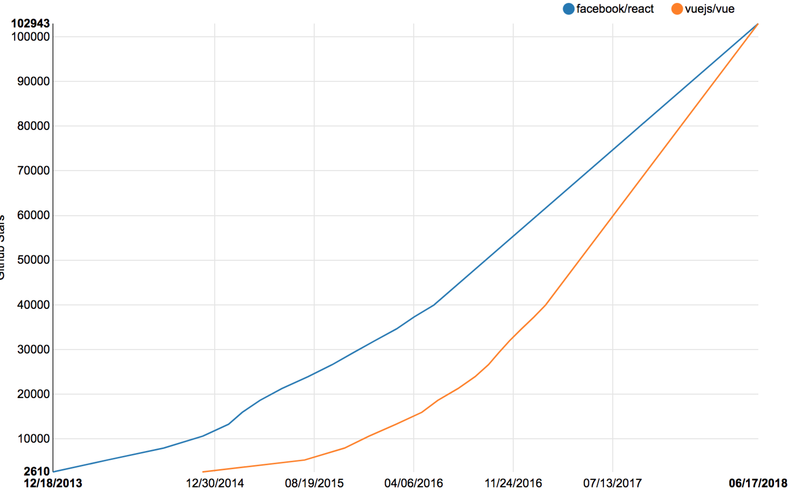 To get a better sense of the relative popularity of Vue vs React, we need some way to measure actual usage of the project. Looking at the last 2 years of data, we can see that in stark contrast to the github stars data, React is still dominating in terms of actual usage as measured by NPM package downloads. This is not to say Vue is not doing well in terms of adoption - in fact, Vue is catching up slightly in terms of multiples, going from around a 12:1 ratio (1.693M vs 141.5k) in June 2016 to a just under a 7:1 ratio (9.388M vs 1.374M) in May 2018. But there is still a tremendous usage gap in favor of React. While the discussion last week was primarily focused on React and Vue, let's also take a look at the other member of the "big 3" frameworks, Angular. Since the Angular community has more or less forked into "Angular.js" and "Angular" (version 2 and later, using typescript), we'll add both of these to our lookups. 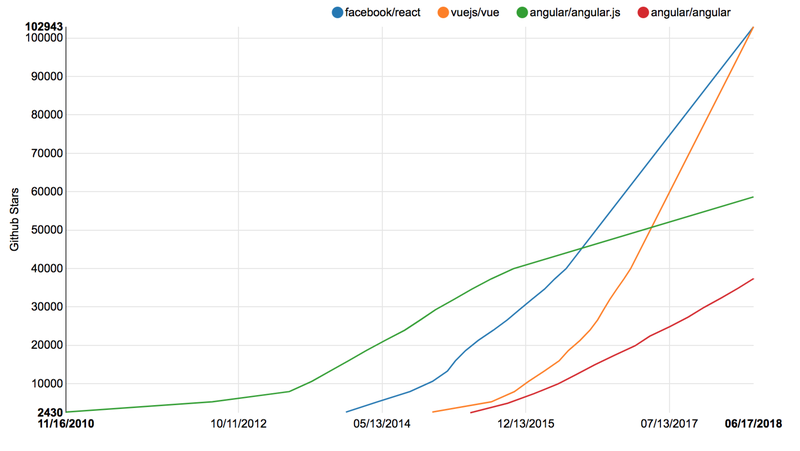 We can see that Angular.js got a bit of a headstart over React and Vue, but was passed by React in "star power" in mid 2016, and by Vue in 2017. The second iteration, Angular, has been catching up to Angular.js gradually since its launch in September 2016, but continues to be 4th in this measure of popularity. Looking at usage instead of "star power" for the two variants of Angular tells yet another story. *The 'angular' package is the original Angular.js, while @angular/core is the core of the new Angular. In terms of usage, the new Angular skyrocketed from nothing to passing both Vue and Angular.js immediately upon release, and has maintained that lead ever since, though coming nowhere close to React. Over that time period, Vue has gone from roughly 1/3 of the downloads of either Angular.js or Angular in Sept 2016, to barely passing Angular.js and achieving 1/2 of the downloads of Angular in May 2018.